She went on to outline some of the incidents she had experienced while living there. Intrigued, I sent her an e-mail, and we eventually arranged a phone interview. When I called her a few days later at her home in Washington State (where she and her family have lived since leaving Marion in the mid-80s), she mentioned that she had kept a journal while she was living at the Tennyson. This journal is, I feel, important for two reasons: First, it lent her story a certain amount of credibility. After all, why would she keep a record that she never could’ve known she would be telling more than 25 years later? It also gave her story a fantastic amount of detail that simple recall couldn’t have provided. And so over the course of a 90 minute interview, she spoke while I furiously tried to jot down notes. What follows, then, is Melissa’s story. Well, my name’s Melissa Cooper, and I grew up in Marion on Uncapher Avenue. When I was 17 and still in high school, I got married to Gary Cooper. Yeah, that’s really his name. [Laughs] We’re still married. We lived in the Tennyson from ’85 to ’86. I was in the OWE program at Harding, and I worked full time at city hall as a receptionist for the transit system. I was also still in school. My husband was working nights out at the Marion Industrial Center. How did you come to live in the Tennyson apartment building? We used to walk home from Harding to Gary’s grandma’s house on Wilson Avenue, and we always walked down Sargent Street. My husband would always point to it and say, “I’m gonna get that house for you someday. We’re gonna live there.” At the time, we thought it was a mansion. We had no idea it was an apartment building. And then I saw an ad in the paper for an apartment, and when we pulled up to the address, it was that exact place. The apartments were nice, actually. When we lived there, the owners were quite studious about the upkeep of the place. And they were gorgeous inside. The building was divided into four apartments. The downstairs had two apartments on each side, and the upstairs was the same. There was also a shared attic and a huge basement. Anyway, we lived on the top floor on the left side. 136½ Sargent Street. The Tennyson apartment building in 2012. So after you guys moved into the Tennyson, what began to make you think the place was haunted? My husband was working third shift, and so I was alone in the apartment most nights. Actually, I was often the only person in the whole building. We had a neighbor lady who lived across the hall from us, but she worked nights like my husband did. There was also an old lady who lived right below us and a man who lived on the other side on the ground floor. But during the winter months, which was when a lot of weird activity was happening, both of the downstairs neighbors were gone. They each had places in warmer areas that they went to during the winter. Well, on one of those nights, I noticed what sounded like a man walking around in heavy boots in the attic. That confused me because I had the only key to the attic. The entrance to the attic was outside our apartment in the hallway. There was only one key – a skeleton key – which the landlord’s gave to us since we were closest. If anyone needed in the attic, they would just come to us for it. Anyway, when I went out to check, I noticed the light wasn’t on up there. So I thought that whoever had been up there must’ve left. So I went back in the apartment, and I could still hear footsteps up there. So I took a flashlight and started up the attic stairs. I remember thinking, What am I doing? I’m walking into danger. This is stupid. There must be somebody hiding up here. Of course, I got up in the attic and turned on the light and didn’t hear any more noises. When I told my husband about it later, he said it was probably an acoustic trick. And then on the next night – literally the next night – it happened again. First I heard the voices of two men, and I couldn’t discern what they were saying, but by the tone it was obvious they were bickering. And then all of a sudden the voices stopped, and I heard what sounded like scuffling. Like they’re shoving each other around. And then it sounded like one of them fell to the floor. And I heard one set of boots dragging something across the floor. Now this is impossible because all of us in the building had our stuff stored up there, so there wasn’t room to drag anything. So I told my husband about this again when he got home, and he just said that it was probably somebody out in the parking lot of Danny’s Pizza fighting and that the sound was bouncing off of the roof, making it sound like it was coming from the attic. I remember thinking, Well, whatever. It sounds like your husband was skeptical at first. Yeah, and I remember being a little irritated about that. But then I thought that maybe he was right. But then other strange things started to happen. Later I started smelling cigar smoke in the house. I didn’t smoke, so I thought it was one of the neighbors, but none of them smoked either. Then I started smelling perfume, too, and I chalked that up to the old lady downstairs. I thought it must be coming up through the floor, but what was weird was that when I would smell these things, I felt as though someone was looking at me. When I smelled the perfume, I wasn’t as scared; but when I smelled the cigar smoke, I felt intimidated, like someone was staring at me and not in a friendly way. I also remember that one day I walked in and the stereo was on, so I figured my husband was home. He wasn’t, though. And the stereo was just blaring away. When I tried to turn it off, it wouldn’t go off. I reached down to unplug it, and I noticed that it wasn’t even plugged in, and this thing was going full blast! The neighbors actually made a complaint to the landlord that day. Anyway, the second I picked up the plug, the stereo went off. So I said to my husband later, “What’s your explanation for that?” And he said I probably pulled the plug out of the wall while I was trying to turn the stereo off. But the stereo was playing while I could see the plug lying on the floor! And then our TV started coming on by itself. And it would always come on full blast, and again I heard from the landlord about the noise. When I told my husband about this, he still thought there was some kind of sensible explanation. But then one night he was sick and stayed home, and the TV came on in the middle of the night. He said, “What the hell is that?” And I said, “That’s the TV coming on by itself.” He got up, and sure enough the TV was on. He said, “I thought I turned the TV off?” When I told him he had, I think that’s when he started to have his doubts about rational explanations. We also had some strange occurrences with the bedroom lights. They had these sconce fixtures with keys at the bottom that you had to turn. But they would both come on at the same time without anyone touching them. My husband thought it was an electrical problem, but an electrician who checked the wiring said everything was fine. In fact, he was confused about why they came on at the same time because he explained that they were not wired to the same circuit! Some nights, just as we would start to go to sleep, the closet door outside of our bedroom would open. This was a pretty heavy door, too. It would open and creek, and then it would slam shut. As soon as we would start to doze back off, it would do it again. After awhile my husband started dealing with the fatigue, you know? Because he couldn’t get any sleep. Do any other events stand out in your recollection? So it seems like the attic was the focus of a lot of weird activity. Yeah, it was. Sometimes it was just noises up in the attic. My husband said he heard what sounded like someone dropping a big glass ashtray up there. I remember hearing what sounded like someone throwing a croquet ball against the wall and then letting it bounce a few times on the floor. Since the noises always seemed to happen just as we were dozing off, after about six months we were starting to feel exhausted. I mean, we were bickering because we were so tired. Do any other incidents up in the attic come to mind? The young married couple: Melissa and Gary. We had a really heavy trunk in the attic that Gary’s grandpa had made. Anyway, he had me stand downstairs while he picked up the end of the trunk before letting it fall. And it made the exact sound we had heard. It definitely wasn’t some raccoon or squirrel up there doing that! A little bit later we heard the same pounding up in the attic, and again we went up there and went through the attic carefully. At the time we even thought it was possible somebody was hiding up there. Anyway, we started back down the stairs, and just as he was locking the door, Gary realized that he hadn’t turned the light out at the top of the stairs. Well, just then we heard what sounded like a man run down to the stairs and stop on the other side of the door breathing hard. It was just an awful sound. The door had this thick leaded glass window, and although we could see through it, no one was on the other side. My friend Frankie took off running and wouldn’t come back after that. I asked him years later why he wouldn’t come back, and he said that he was afraid that whatever was on the other side of the door would follow him home. I wanted to ask you: Up to now, everything you’ve described has been either something you heard or smelled – spooky things but essentially harmless. Did it ever go beyond that? Did anything happen that made you feel as if you were in danger? Yes. My husband had a class ring that his grandma had bought him. And it was huge. My husband wears a size 13-and-a-half ring. He’s built like bigfoot. [Laughs] Anyway, it’s what we used as a wedding ring when we got married since we didn’t have money for a proper ring. Well, one time he took it off and laid it on the kitchen counter to wash his hands. When he went to pick it up, it was gone. We looked on the floor. We looked down the drain. It was just gone. And so Gary, who was getting ready to go to work, told me, “Find that ring!” So I searched that whole place and couldn’t find it. Later he called me from work to ask me if I’d found it. I still hadn’t and felt really badly about it. Later that night I went in the bathroom to wash my hands, and I took my wedding rings off and put them in a little dish there on the sink. After I got done washing my hands, I realized the rings were gone. My first thought was that they had gone down the drain. So I went to get a flashlight, and that’s when I saw my husband’s ring sitting on the kitchen counter. Right then I knew something was toying with me. And now it had my wedding rings! I remember I started crying because I was scared. I remember even saying out loud, “That’s not funny. These are my wedding rings. They’re precious. How could you mess with someone’s wedding rings?” Just then I heard a glass break in the bathroom. When I went in there, the wedding rings were on the sink where I had left them, and a glass that I had sitting on the sink had fallen to the floor and smashed. I think that was the first time I told my husband that I wanted to move. I thought that if this thing could move something, then I’m scared. Is that when you decided to move out? No, we didn’t have the money to move out. I mean, I wanted to leave! Actually, that reminds me of another attic incident. We were arguing one night because I wanted to move out. Finally, I just left, you know, to give us both a chance to cool off. Well, my husband said that the second I shut the downstairs door, all hell broke loose up in the attic. He eventually took a six pack of beer up there, sat down and said, “All right, here I am. You want to scare me? Well, scare me.” Immediately he heard this weird noise he couldn’t quite place until he saw what looked like the lid to a coffee can or Cool Whip container, and it was spinning on its side like a coin. But just like that, it looked like an invisible hand slapped it down flat. That’s when he ran. He said he dropped his beer and ran down the stairs. When I came home a while later, he told me about what he had seen. We went back up into the attic, and eventually took a buckeye and sat it in the middle of that big trunk I mentioned earlier. We sat it right in the middle of that big old trunk and said, “Come on, move the buckeye. Just move it an inch. Prove to us that you’re here and that you want us gone.” Nothing happened. In fact, we sat there so long that we got bored and eventually went back downstairs. But as soon as we got back downstairs, we heard an awful ruckus going on upstairs. Although we had always heard a lot of noises up in the attic, nothing was ever disturbed. But that night when we went up there, it was a big mess. Everything – boxes, old furniture – was upended. Everything except the buckeye. Where were your neighbors while all of this was happening? Did they ever say anything? Did you ever discuss anything with them? I talked to all of our neighbors at some point. But most of the weird stuff happened during the winter months, and, like I said, that’s when the downstairs neighbors weren’t even living there. After winter when they were back, I asked them if they had ever heard or experienced anything weird up in the attic, but they all said no. In fact, the guy downstairs said that the only thing in the building that bothered him was us. [Laughs] See, a lot of the noise they were blaming on us wasn’t really us. Up until this point there were two manifestations – there was the perfume, which you associated with a woman, and the smoke, which you associated with a man. But you said in your e-mail you’d also heard a baby? Right. Well, it’s like this: One time our rent money went missing. At the time, I accused my friend Benny of taking it, but he swore up and down he hadn’t. Anyway, it was while our rent money was still missing that I invited a girlfriend over to spend the night. While she was over, she asked if she could borrow my Polaroid camera. When I went into the closet to get it, I opened the box to make sure it had film, and there was my rent money. In the camera case. I must have had some look on my face because my girlfriend said, “Melissa, what’s wrong?” And I just said, “My house is haunted!” I kind of told her the stories about what had been going on, and she said that she didn’t really believe in ghosts, and she thought it was all dumb. A little while later, we were sitting in the living room and this huge shadow passed by the bedroom door. I saw it but didn’t say anything because I didn’t want to spook her, but then she said, “I thought you said Gary was at work.” I told her that he was. And she said, “Well, who’s in your bedroom?” I told her there was no one in my bedroom. “No,” she said, “I just saw Gary walk by the door.” “Angie,” I said, “he’s at work. I’m telling you my house is haunted. There’s no one there.” She still didn’t believe me, so we got up and looked around the apartment, and she saw there was really nobody else there. So we sat back down in the living room, and she said, “Turn off the lights so that I don’t have to see it.” I thought that was really funny, and I told her, “Don’t worry. The lights’ll go off by themselves in a few minutes.” Which they did, and that really freaked her out. So I went back up to the apartment, turned on the TV and went to bed. As I was dozing off, the blinds snapped up and some of the windows flew open. Snow was blowing in through them. I remember just getting up and getting dressed as fast as I could. I was leaving with no idea of where I was going to go. As I went through the rest of the apartment, I saw that cupboard doors and drawers were open. The refrigerator was open. Even the bird cage was open, and the birds were flying around. I ran out of the apartment. It was about three thirty in the morning, and I sat outside waiting for my husband to get home at six thirty. I remember I didn’t even have my own shoes on – I’d put on a pair of his boots – and I was frozen. I told him, “I’m not going back up there, and you can’t make me. Eventually, though, he talked me into going back up there. The place was in the exact shape it had been when I ran out. It was just a wreck. So we closed everything up and went to bed, and after that everything seemed to settle down for awhile, though we still heard occasional noises up in the attic. 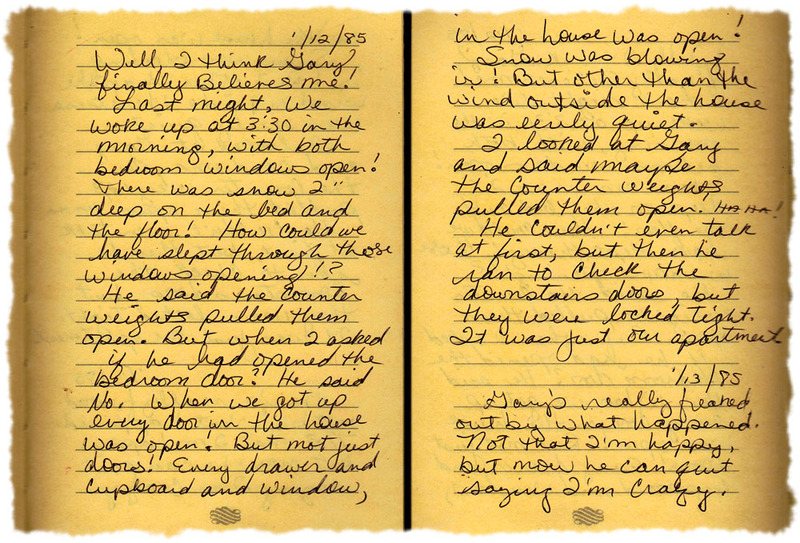 The actual journal that Melissa kept during the winter of 1985. But then a few weeks later, we woke up to discover a good inch of snow on the bedroom floor from an open window. Actually both windows were open. What woke us up was the snow plow in the parking lot. When we got up, everything in the house had been opened again. That was the first time my husband had had that experience, and so we were both scared. Did you ever talk to you landlord about what was going on at your place? What was the landlord’s name? You know, for the life of me I can’t remember their names. 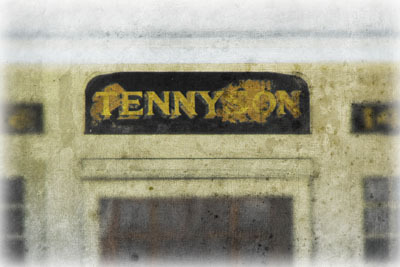 I know it might be useful in tracking down information about the Tennyson, but I can’t remember them. Do any other disturbing incidents come to mind? One night we were in bed and heard what sounded like glass breaking. We got up and both of us fully expected –I wrote about this in my diary –to find everything in the house broken. But instead all of the windows, drawers, doors and so on were open again. As we were going through our apartment, Gary noticed that Marilyn’s door was busted. Marilyn was our neighbor right across the hall. 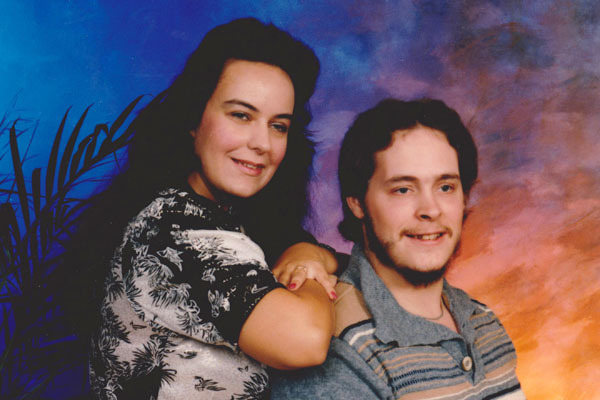 She was working that night, but Gary had come home early because of bad weather – he drove a forklift out at the Depot, and it had just been too cold to keep working outside that night. Anyway, he called the police and said that someone had broken into the place. As for me, I just assumed it was a ghost. I mean, after all we had seen at that point. Later, after the police left, I talked to Marilyn. I asked her if she had ever heard anything strange in the attic or felt uneasy in her apartment. She said she’d never heard or felt anything. Nothing. That had to be disheartening. Did anyone else witness any strange occurrences in the apartment? About two months before my brother Matt died, we got on the subject of one of his old girlfriends. I’d really liked this particular girl, and I asked him why she had stopped coming over to our place at the Tennyson. That’s when he told me that once, while they were sleeping over at our place, they had experienced something strange. Matt said that the two of them had been sleeping on our couch, and she kept waking him up all night to tell him that somebody was walking through the apartment. At one point she said she even saw what looked like a dark shadow of a man leaning over her, and she could feel him breathing in her face. My brother said she was just dreaming. Finally, she woke him up and said, “Do you hear that in the kitchen? There’s something going on in the kitchen.” And so Matt, thinking it was me making the noise, got up and went into the kitchen and saw that nobody was there but that all of the drawers and cupboards were open. He never told me about that at the time. Anyway, that’s the reason his girlfriend stopped coming over. When did you finally move out of the place? We actually got evicted. One day the landlord knocked on the door and handed me the eviction notice. When I asked why, he said it was because of the noise. It was the guy downstairs who had complained. Like I said, at the time my husband didn’t want to leave because we really didn’t have the money to move. After you moved out of the Tennyson, you moved into another apartment. Did anything happen there or was it all quiet? Nothing out of the ordinary happened at the new place. It was an apartment house over on Pearl Street, I think. We lived there for about a year before heading west. And how did you end up in Washington? Well, it’s probably pretty clear from what I’ve told you so far that we were kind of partiers. [Laughs] There were a lot of bad influences in Marion, and there was a lot of trouble for us to get into because there was nothing else to do. When Gary’s grandmother gave us some money, we decided to drive out to Washington to visit my brother who lived out there. And we stayed. My husband ended up getting a job at Boeing, which is where he still works. I remember looking at an apartment at the Tennyson once, it was probably around 1980, ended up renting a different apartment….boy am I glad that we took the different one! I lived in that exact apartment until May of last year. My aunt lived beneath me. Wow, I lived in apartment 3, which was the same apartment. My aunt complained a lot about hearing the boots, and we complained about smelling smoke. My aunt would call when me and my mother were asleep and complain we were walking heavily over the floor. I am the husband in that story. I can attest to the truthfulness and consistency of that whole story. Many other things happened there, and we could tell ghost stories all night about that place. Just wondering if anyone who ever lived there noticed the hardware inside the living room closet? First off the door was made of solid oak two inches thick or so. It closed more like a vault door and in common sense it should have been the security door or the entranceway door. I noticed that inside the closet door on the inside were huge brass bolsters with a hole in it that had a good 1/2 inch of brass thick and wide plate held into the solid oak doorway with screws that had heads 3/4 to an inch across so were sunk very deep. I stepped into the closet with a flashlight and noticed that one of them was just under the door knob and had a hole in it an inch across, that corresponded to another plate just like it at the floor level. I then noticed that the bar in the closet was one inch thick bar stock, solid steel and that if one would remove the bar and place it behind the welded doorknob, thru the 1/2 inch thick plate that was now below the doorknob, and into the matching one on the floor level. This would most effectively barricade you and yours into the closet in a most effective safe room. It would take an hour to chop thru the door with a good axe. This was solid hardwood. What strikes me about this story is that, in addition to being a haunted house story, it’s also a pretty good love story. It’s pretty cool that two teenagers could get married so young and go through all this (and probably a whole lot of other non-supernatural hardships that life always seems to have in store for us, ha, ha) and still be together. I think I remember an old neighbor of mine saying there was a murder-suicide there in the 1950s. I know Gary and Melissa from Harding and the neighborhood, and they were always the responsible ones while the rest of us were busy just hanging out. If they say this happened, I do believe them. I miss them – they were really great friends, and this is a true love story . My grandparents have owned the apartment building next door, the Netherlands, for probably 45 years. They haven’t really rented to many people over the years. My family – my siblings, cousins – we grew up playing there all our lives; in the apartments, in the attic, the basement. 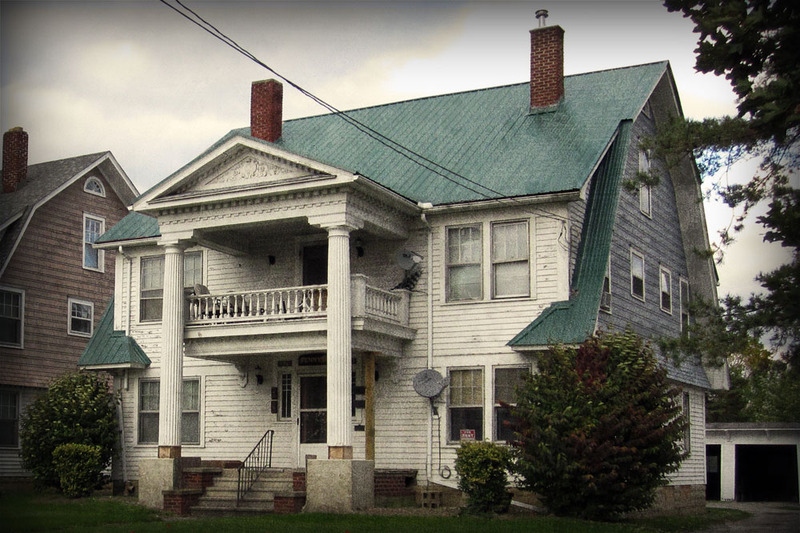 Many family members, including myself, lived in the upstairs apartments at different times. We never noticed anything creepy, ever. But wow, right next door! As I read the first part of this and the incidents, I was like your husband Melissa, chalking it up to the noisy car wash on the other side of my grandparents. They ALWAYS complained about it. But then as I read more, I decided I was glad it never came to grandma and grandpas building! The stuff creeps me out. As a Christian, I very much believe, because the Bible tells us, that spirits here are only of the devil. I’m not sure what even lead me to this site, but I was intrigued when I saw this story, naturally! I can’t remember hearing any family say anything, but now I may have to ask my mother if she had ever heard of the place next door being haunted or of anything tragic happening there. I used to deliver the Marion Star to two residents of that building. Both on the first floor. As you walk in, the guy who lived in the apartment on the right was always late paying so I’d show up really early on Saturday mornings and beat on the door. Sort of a tactic to get people to pay by being annoying. Anyway, it was 1981. The place always sort of made me feel uneasy. It had an erie feeling about it every time I went in there. I’d drop the papers at the front door and get out fast!! Wow thanks for your story John. Yes it is a creepy building.